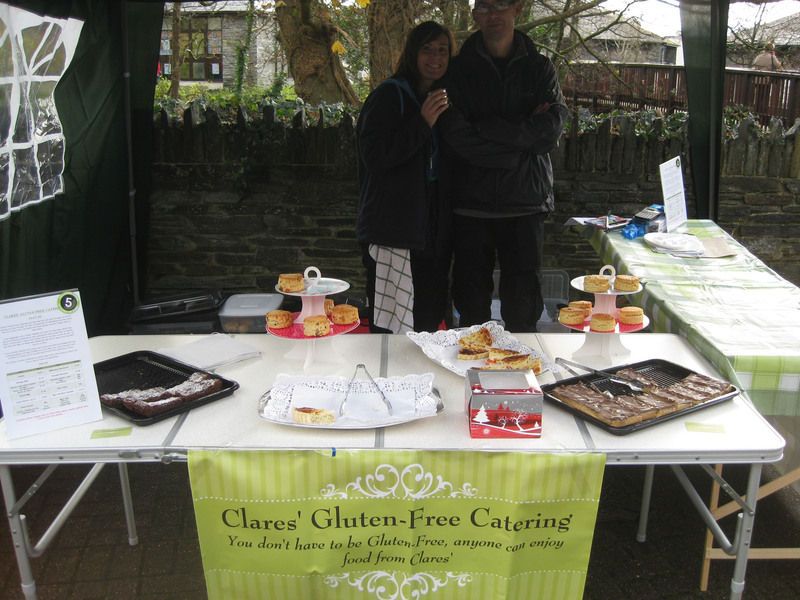 Earlier this year, as part of my work for the Coeliac UK Plymouth group, I’d heard from Clare Jones to say she was starting a gluten free catering company in Plymouth. The thought of an exclusively gluten free company, run by a coeliac of 40 years and based in my home town was extremely exciting. The list of proposed products included pies, pasties, sausage rolls, quiche, scotch eggs, various cakes and more. During the coming months Clare launched a website and amongst the listed products were chocolate eclairs, doughnuts and many other amazing looking treats. After drooling over more pictures of her food on her Facebook and Twitter accounts, I invited Clare to come and sell her products at the Coeliac UK Plymouth group pre-Christmas food and craft fair. Thankfully she accepted and it was great to meet her and her family for the first time, not to mention sample her delicious chocolate Yule log! Subsequently Clare and husband Jon exhibited at the Christmas ‘Free From’ Food Fair at Ivybridge Community Market that I helped to organise. I am very grateful to Clare for coming along to support these events. 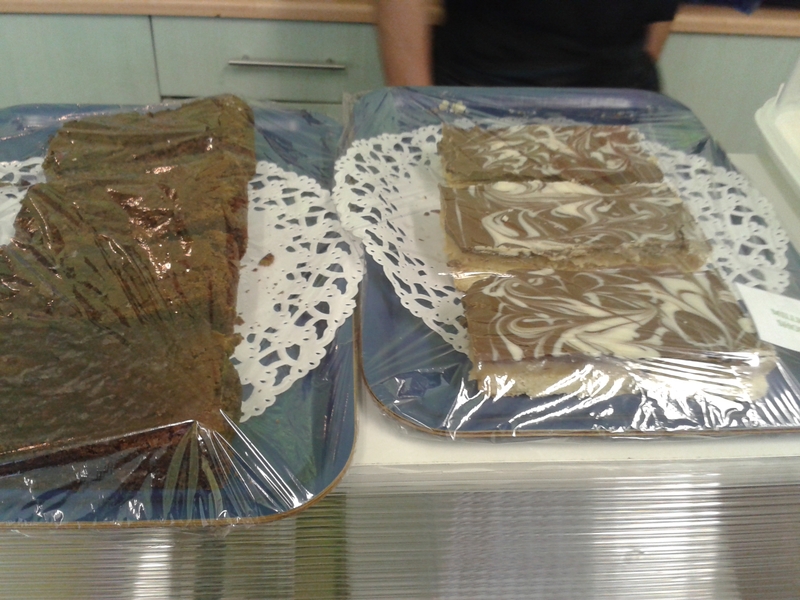 At Ivybridge I purchased some of her millionaires shortbread. I used to love millionaires shortbread before my coeliac diagnosis, and I have to say this is the nicest gluten free one I have tried by some distance, and probably better than most of the gluten filled ones I’ve had too. 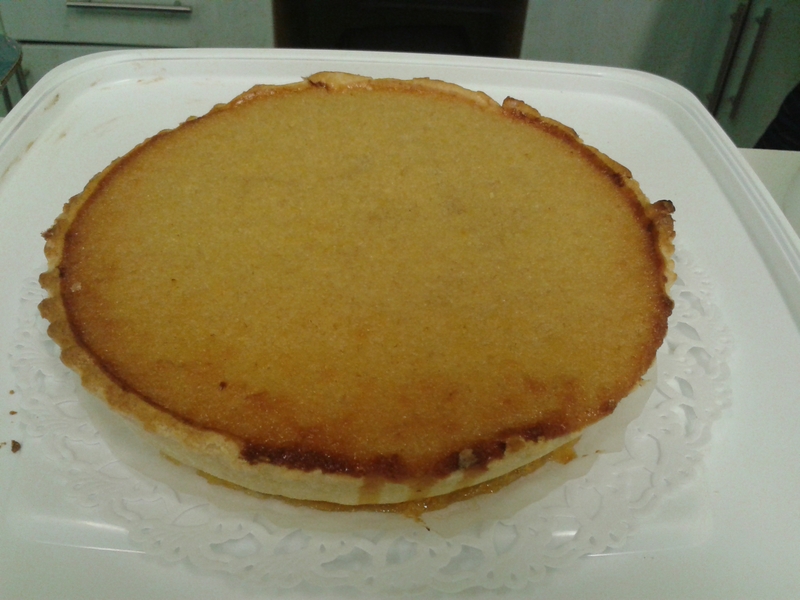 The shortbread is great, the soft caramel delicious and all topped off with chocolate. So impressed was I with Clare’s products I decided to get in an order for Christmas. 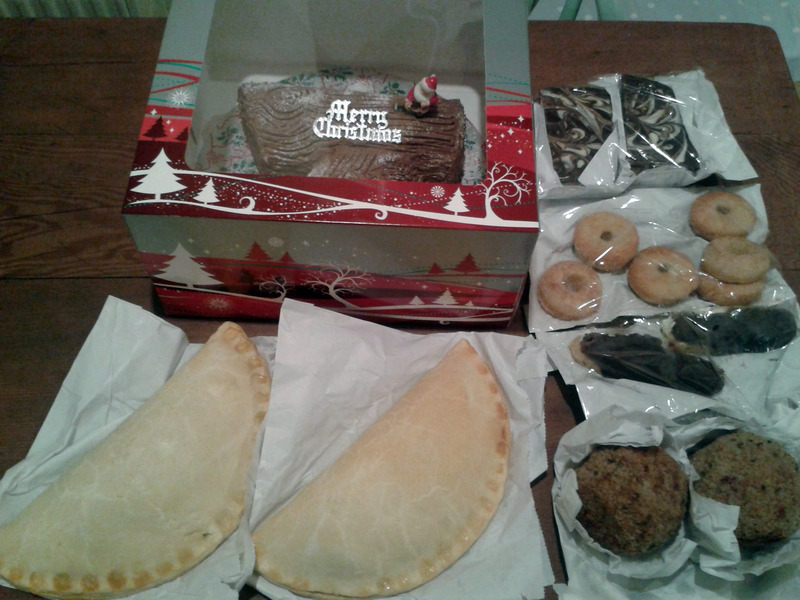 I treated myself with a full version of that Yule log, a couple of steak pasties, some mini ring doughnuts, a couple of scotch eggs, a few more slices of millionaires shortbread and even a couple of chocolate eclairs! A truly great selection of my favourites in gluten free form from one company, and based in Plymouth too. First I tried the scotch eggs. A whole egg, wrapped in sausage-meat and gluten free breadcrumbs. This was well seasoned and extremely tasty, nice enough that I ate both in one sitting! 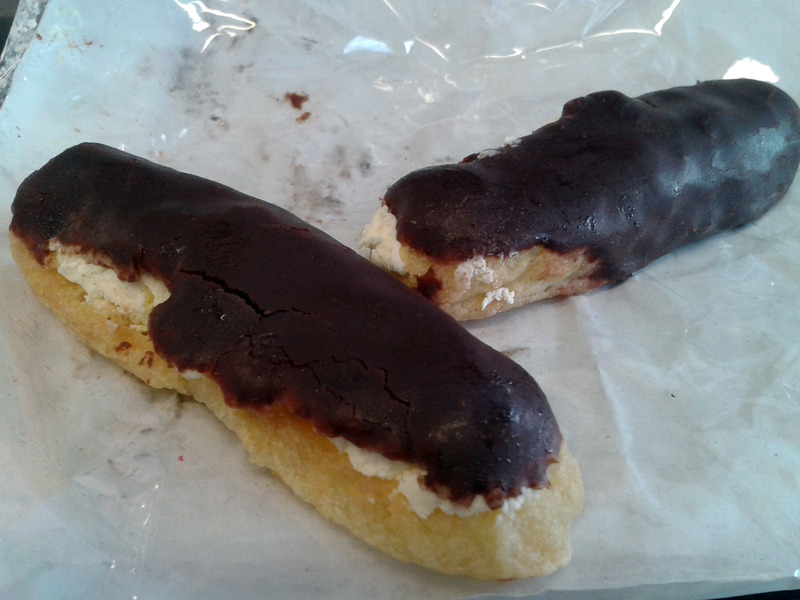 I was perhaps most excited by the eclairs, as I’d not eaten one in over three years. The pastry was perhaps not quite what I remembered but they were delicious nonetheless. Of course I also had to sample a pasty and again these were great. The pastry was very good and the filling was made with steak as a good pasty should be. There was plenty of veg too and again this was very well seasoned. Clare advised to warm the doughnuts briefly in the microwave, and they were great too. All of the above products are available to order for delivery in the Plymouth area, but there is even better news for the gluten free folk in Plymouth. 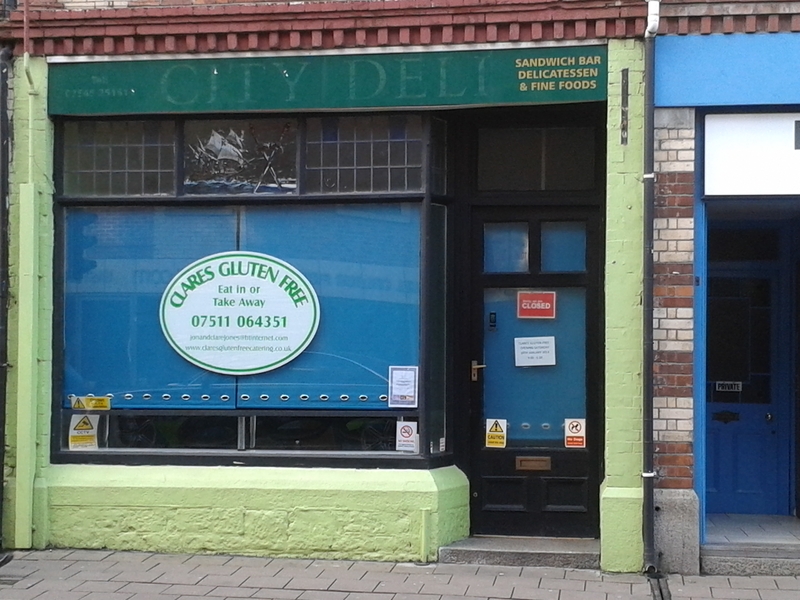 Clare’s Gluten Free have now opened a cafe/shop in Bretonside, Plymouth. The cafe is to my knowledge the only exclusively gluten free eatery in Plymouth, and I don’t think there can be that many in the UK. Food is available to eat in or take away. There is a great range of food available, including warm pasties, pies and sausage rolls in the warmer ready for a quick takeaway. Jacket potatoes, quiche, freshly made sandwiches, toasties and pancakes are also included in the range, along with a soup of the day and a special of the day. Saturday’s opening day special was lasagne, chips and a side salad for a very reasonable £4.80. 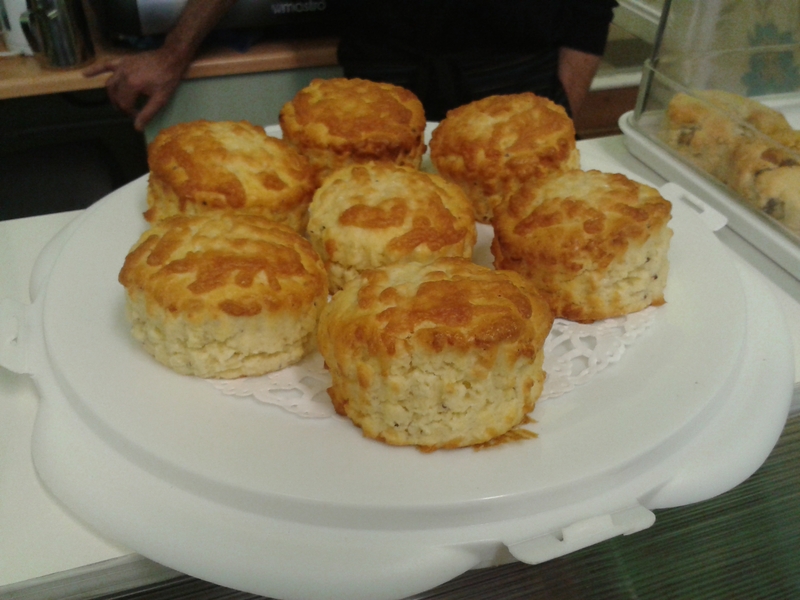 You can also grab a cream tea and of course choose from a range of sweet treats. One of the things that really caught my eye was the cooked breakfast, which is currently only available at weekends. 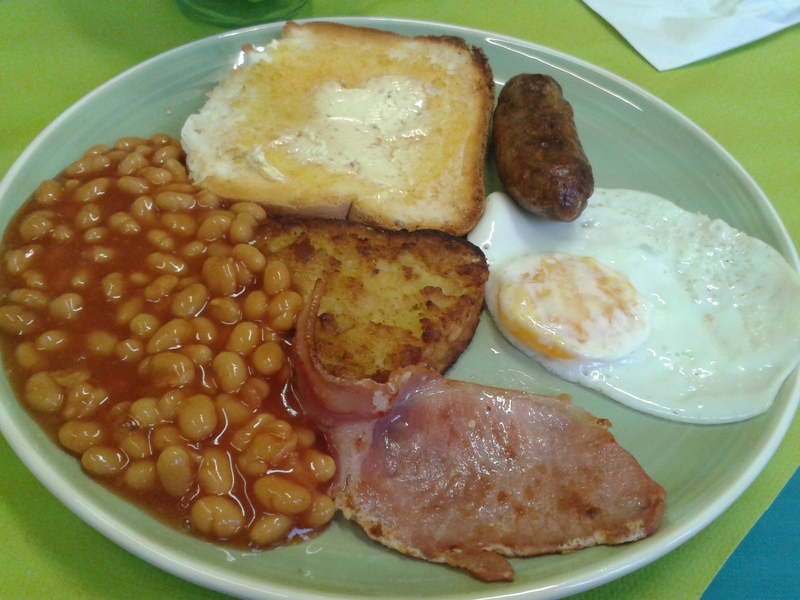 A safe gluten free fry-up can be very hard to find, and I can see me being a regular visitor with my dad for this alone. I went for this on Saturday and it was lovely. You may be surprised to hear I bought another piece of millionaires shortbread to takeaway with me, along with some chocolate brownie for my wife. I tried this too and it had great consistency. For the full menu see here. I am unbelievably lucky to have this only a 15 minute walk from home, and also a 15 minute walk from my office. I am very much looking forward to being able to enjoy a walk on The Hoe with a warm gluten free pasty during my lunch break! For those requiring dairy free, they have soy milk for tea/coffee, dairy free spread for freshly made sandwiches/toast, dairy free custard, and several of the savoury items were naturally dairy free. They also had a diary free fruit flan as a dessert choice, and Clare says she is working on getting more dairy free options going forward. Also look out for special event evenings at Clare’s. Bookings are currently being taken for this Friday evening, 24th January for beer battered fish, chips and mushy peas, available from 7.00pm until 10.00pm. This is for eat in at the Bretonside cafe only with booking required in advance, the price is £8.50 per person. To book call 07511064351. I hope you all stop in and check this place out, we are lucky to have this in Plymouth and I hope the business is a great success. For more photos of the cafe, please see this photoset on the Gluten Free by the Sea Facebook page. I’d like to wish Clare every success with her new venture.